Telamon is your partner for energy solutions projects. The IND Solar Farm is the largest airport-based solar farm in the world at the Indianapolis International Airport. The solar farm was completed in 2015 and annually produces enough energy to power over 3,600 homes in Marion County, Indiana. Initially, Telamon Energy Solutions served as Tri-Creek’s design and engineering consultant, helping them to select a design for their 1.7MW array. After design selection, Telamon oversaw construction, leading Tri-Creek to over $200K in savings. 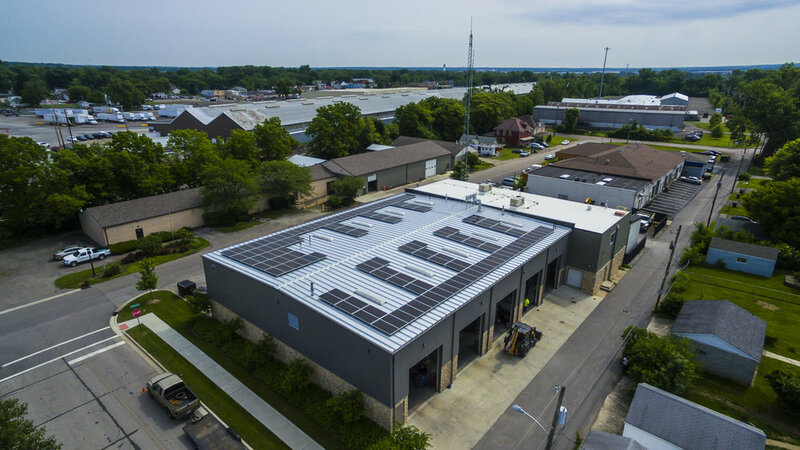 Working with Indianapolis’ City Transit system (IndyGo), Telamon Energy Solutions designed and engineered a 1 MW rooftop array that is one of the first of its kind in the nation. The rooftop array creates the power necessary to fuel IndyGo’s electric fleet of 26 buses. Spread over three sites, Telamon Energy Solutions designed and built a 226 kw system to serve the local utility by providing energy less than the cost of buying from the grid. The City was able to lower cost and mitigate risk from energy inflation, all while reducing the carbon footprint of the community. The City of Bexley wanted to reduce and take control of their carbon footprint and the cost associated with their energy needs. After developing an ongoing dialogue with the Mayor, Telamon Energy Solutions was able to turn his vision into reality by creating rooftop arrays throughout the City. Working with the utility to showcase the benefits of solar, Telamon Energy Solutions was able to illustrate significant cost savings while holding and maintaining a flat cost of energy. With slightly less than a megawatt, the huge power demands from the water treatment process were addressed using solar design while providing decades of energy savings. Telamon Energy Solutions increased Conner Prairie's foot candles by 350% for improved security and safety. Conner Prairie saves approximately $10,000 annually with the updated lighting, including a 20% return on investment. Working with the Carmel Parks and Recreation Department, Telamon Enegy Solutions’ energy engineers completed an assessment of their energy cost and created an energy strategy to lower costs for one pilot property, the Monon Center. To assist our solar customer, the City of Plymouth, we conducted lighting analysis, return on investment calculations, and completed the installation of LED lights at five schools in just four months. In a rapid response to Cardon’s desire to take advantage of federal tax incentives, Telamon Energy Soltutions in one week created a fiscal analysis to show a massive 66% savings in lighting costs in nine facilities across the state. Eight weeks later, LED lights were installed in nine locations from Evansville to Anderson. As students and parents expressed concerns about the darkness in the student parking lot, Telamon Energy Solutions added LED fixtures and increased the output of the lights by over 50%. With this project, the existing pole structures were able to be used, adding to increased savings for the schools. Many parts of the state experience higher costs per kWh, particularly in northern and southern Indiana, and LEDs can provide significant savings. Telamon Energy Solutions worked with Anabaptist to integrate new lighting technology by using their existing fixtures without diminishing the look and feel of the institution.